Friends Hut was built in memory of 10 people from Aspen and Crested Butte, CO, who perished when two small planes collided in 1980 near East Maroon Pass. Because passengers of the planes were from both towns, the hut was designed as a link between the communities of Aspen and Crested Butte. Permitted by the U.S. Forest Service under the Gunnison National Forest, The Friends Hut, Inc. is a not-for-profit organization dedicated to providing a unique and truly remote backcountry experience to backcountry skiers. 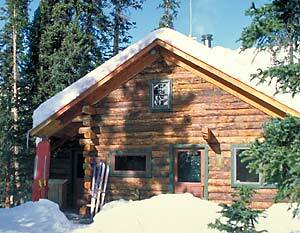 Here are several backcountry skiing articles with extensive Friends Hut information. Layout and capacity:Friends Hut is a one story structure with a sleeping loft. A small room with double bed is the only private sleeping. Amenities: wood stove heat, firewood, propane burners for cooking, photovoltaic lighting, cookware, dishes, mattresses, pillows, and toilet paper. Hut users melt snow for water. Friends' Hut sleeps 8 and is booked to capacity. There is no minimum booking number. If you do not reserve all eight spaces, other groups may be booked in with you. NO DOGS! On the north side of Pearl Pass, headed to Friends Hut. Warning: The Alfred A. Braun Huts and Friends Hut are located in areas of known avalanche terrain with recurring avalanche cycles. Routes are not marked or maintained. 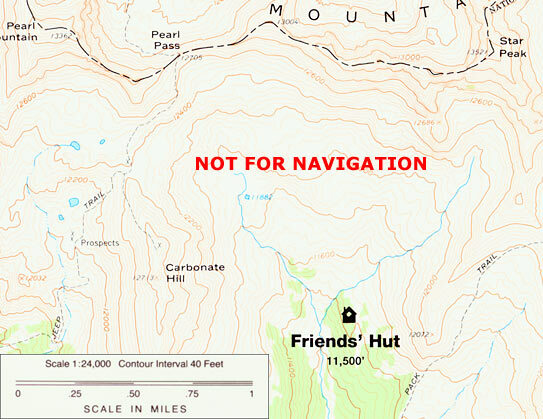 The Friends Hut can be accessed from either Crested Butte on the south side of Pearl Pass or from Ashcroft on the north side of Pearl Pass. 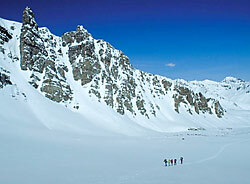 When skiing in from the north side you can ski all the way into Friends Hut from Ashcroft in a day but many people go first to the Tagert or Green Wilson hut for a night then over to Friends. Be aware that the last half of the route over Pearl Pass from the north offers only a few safe travel options due to avalanche terrain and during times of high avalanche danger the route may be impassable. Traveling from Ashcroft to Friends Hut in a day is best done during times of low avalacnhe danger and good weather. Skiing in from Crested Butte via East Brush Creek is the most common route to Friends Hut from the south but is still approximately 10.5 miles and crosses numerous avalanche paths along the upper part of the route.